I have introduced Japanese fermented soybeans called natto on my blog before. Natto is a very healthy food, but it seems to hard for foreigners to love natto. How about you? Today, I would like to offer some more recipe arrangements which may help you to appreciate natto (^^). 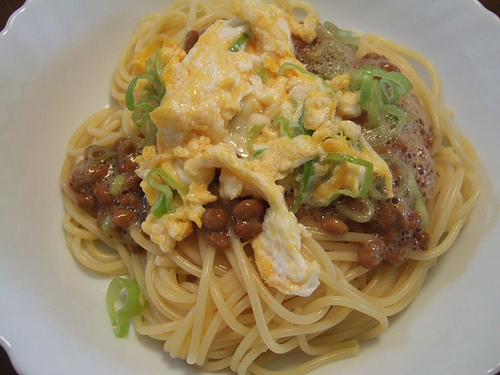 There are many ways to cook natto spaghetti, but the one in this photo is very easy. 1) Mix natto and green onion. 2) Add sauce which is included with natto when you buy it. 4) Add salt and pepper. 5) Put natto and egg on boiled spaghetti. The egg can be raw. This is also good to mix with canned tuna or kimchi! 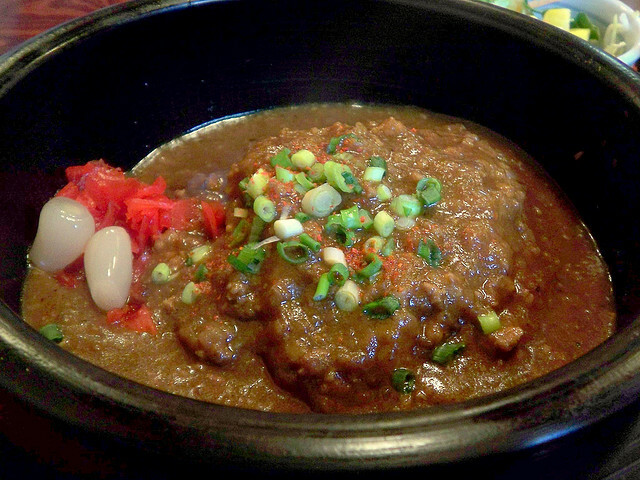 The curry in the photo above is served at a restaurant; chopped natto is cooked in curry sauce. But usually people just put mixed natto on Japanese-style curry rice. That’s it! Natto makes spicy curry mild and more delicious (^^). Look at this beautiful dish! This is called goshiki natto. “Goshiki” is literally “five-colored” but sometimes just means “colorful”. So, goshiki natto is usually made with five or more ingredients. You can chose any ingredients you like. However, cucumber, a few kinds of sashimi, Japanese pickles, and something green like okra, Japanese basil leaves, or green onions, are common. 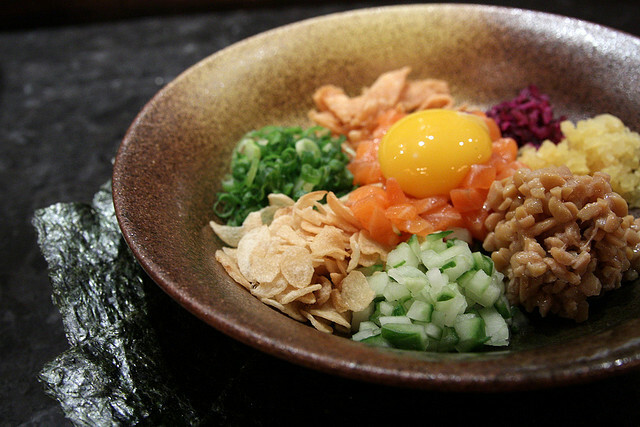 Just chop those ingredients along with the natto, arrange them on the plate beautifully, and drop a raw egg yolk in the center. The one in this photo has garlic chips as well. Mix everything up with soy sauce just before eating, and each person wraps the mix in a crispy nori seaweed sheet. Maybe you can add some wasabi. Sounds good, doesn’t it?